Following the Great Recession and housing crisis from 2007 to 2009, the United States experienced widespread rates of foreclosure, among other economic turmoil. During this time, new research dedicated to determining the relationship between foreclosure rates and crime rates began to emerge, as researchers and policymakers alike wanted to understand the negative externalities of the falling economy and of the rising foreclosure rates specifically. While there have been a number of studies completed across the country since then, research on the relationship between foreclosure and crime has yet to provide a strong empirical basis for further analysis. As a result of the relative lack of research, many cities throughout the United States (and abroad), such as Durham, North Carolina, lack a solid foundation on which to model foreclosure and crime relationships. Through this current study, I hope to expand on my previous study and continue analyzing data related to distressed homes in Durham and data related to crime around the sampled homes over the three years from 2012 to 2014. By expanding this study to cover multiple years, I aim to specifically analyze the relationship between crime and a property during the various stages of distress. The housing crisis that swept the U.S. during the Great Recession contributed to the perceived need to study cities and neighborhoods that have been hit the hardest by poor economic conditions related to foreclosure. Unfortunately, many results of these studies have been inconclusive and mixed. Adding in large part to the confusion is the inconsistency across studies in the units of analysis, definitions and measures of foreclosure and distressed properties, and analytical strategies needed to link these economic events to crime rates (Baumer et al. 2012). To examine the relationship between foreclosure and crime in a variety of major U.S. cities, Baumer et al. employ foreclosure rates as the primary independent variables and focus on incidents of robbery and burglary as the primary dependent variables. Controlling for neighborhood and prior-crime variables, the researchers found that there was a significant variability across cities. In addition, Baumer et al. find different patterns for their two dependent variables. With respect to robbery, the results suggest that foreclosure is more strongly related to robbery in cities with higher levels of socioeconomic disadvantage and lower overall levels of foreclosure. On the other end, higher rates of foreclosure are more closely associated with higher burglary rates, in addition to other factors such as a shrinking police force and little new housing. In a similar vein, Katz et al. (2011) focus on the drivers of policy that come from foreclosure-crime research. Namely, the researchers were interested to understand whether and how long foreclosure causes crime rates to rise. Bringing in the context of the most recent U.S. housing crisis, the authors examine whether there is a linear and crisis-specific effect of foreclosure on neighborhood levels of crime and also examine whether there was a time lag in the impact of foreclosure on neighborhood levels of crime. Regarding the first objective, Katz et al. suggest that foreclosed homes may not have long-term negative impacts on crime in a given metropolitan area. Instead, their results show that foreclosure has a short-term impact, typically no more than 3 or 4 months. On the second objective, the authors find that the relationship between the housing crisis and increases in crime are not linear, but rather are characterized by short-term fluctuations. Jones and Pridemore (2012) contribute to existing research by providing city-level analysis that incorporates nearly 150 major metropolitan areas from across the country. Their approach focuses on data from 2006 forward, so as to capture the trends of foreclosure and crime throughout the period of the Great Recession and in to its aftermath. Jones and Pridemore’s approach differs from previous research in one important aspect: instead of using foreclosure rates as the primary independent variable in their study, the authors instead elect to employ a new indicator, the Housing-Mortgage Stress Index (consisting of three variables: negative equity, loan-to-value ratio, and the monthly mortgage cost-to-income ratio), to capture a more complete and accurate set of information about foreclosure-associated economic stress in a city. Using the Housing-Mortgage Stress Index as the main independent variable, the authors’ results suggest that the housing crisis is not associated with metropolitan rates of serious violent and property crime. Unlike the previous three teams of researchers, Ellen et al. (2013) employ point-specific and longitudinal crime and foreclosure data to understand the relationship between foreclosure and crime in New York City. Their study uses blockfaces – individual street segments, including properties on both sides of the street – to compare the changes in the crime level of a given blockface before and after homes on the blockface enter foreclosure with the changes in the crime level of a different blockface in the same neighborhood that did not experience a change in foreclosure activity during the same time period. The researchers reason that, as crime trends are likely to be the same along different blockfaces in the same neighborhood, their difference-in-difference model can identify whether foreclosures lead to higher crime rates. They also include estimates that control for future foreclosure notices on a blockface, through which they hope to capture the unobserved trends between blockfaces where foreclosures tend to occur and those where they do not. Their results show that foreclosures on a blockface lead to a small number of additional crimes, with the largest effect on the rate of violent crimes. Furthermore, their results suggest that the effects are largest for foreclosed properties that go all the way through the foreclosure process to an auction. The researchers also note that their methods do not allow for results to determine the net changes in the overall crime in a city, only changes in new crimes around the localized area of a foreclosure. Similarly, Cui and Walsh (2015) focus on understanding the effects of a given foreclosure on crime levels in the immediate vicinity of properties in Pittsburgh, Pennsylvania. They pay special attention to identify the separate impacts of foreclosure duration and vacancy on the rate of crime observed. 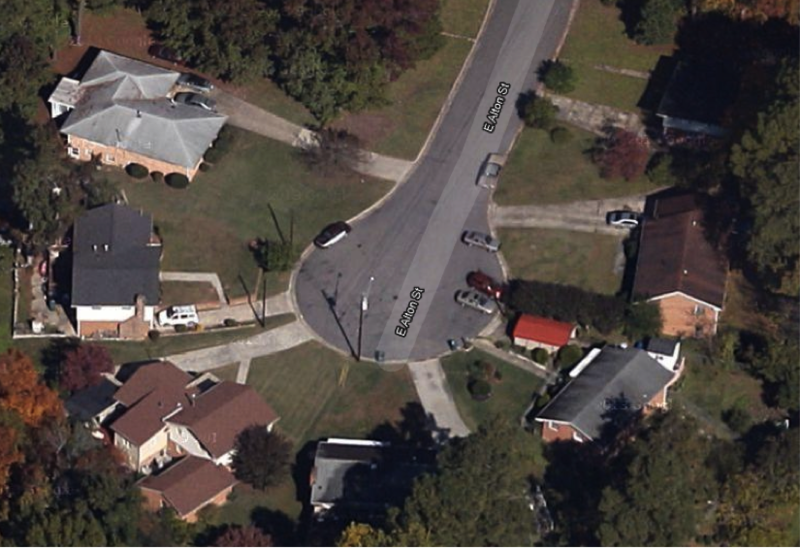 Cui and Walsh are unique in defining treated neighborhoods as a 250-foot buffer surrounding each foreclosed house, and they define control neighborhoods as an equal area donut surrounding this buffer, which is the area from 250 feet to 353 feet away from the given property. They elect to use these neighborhood definitions to more specifically lessen concerns regarding the common trends assumption when dealing with larger neighborhood definitions. Their results suggest that the foreclosure process can lead to significant increases in violent crime rates within 250 of the property. In addition, the results suggest that crimes associated with foreclosure do not occur during the early stages of foreclosures, but instead by the vacancies that are associated with the foreclosure process. The impact of vacancy on crime increases when the property stays vacant for longer periods, with effects plateauing between 12 and 18 months of vacancy. Their results also suggest that once a home is reoccupied, the crime impacts of the recent vacancy are reduced. Despite the housing crisis and Great Recession from 2007 to 2009, the total number of crimes per capita in Durham has been trending steadily downward from 2000 to 2014. Looking only at the trend in Figure 1, it would be very difficult to predict any type of economic turmoil around 2007-2009, given the consistent decline in crime rate. However, from 2012 to 2014, the total number of crimes per capita have leveled off slightly, decreasing about 5.9% from 2012 to 2013, but then rising about 12.0% from 2013 to 2014 (which equates to about a 5.4% increase from 2012 to 2014). 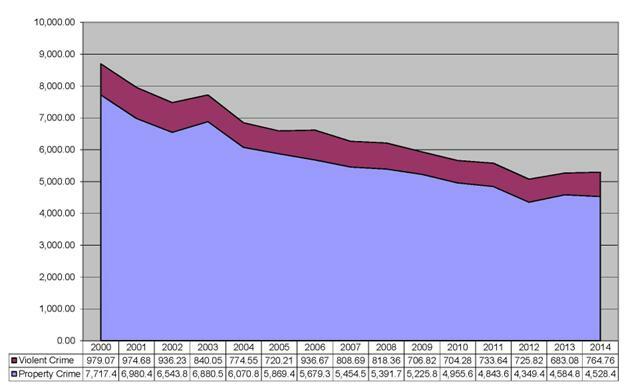 While crime levels appear to be dropping overall since 2000, property crime (defined here as the combination of larceny and burglary) continues to be the type of crime most committed in Durham since 2000, representing at least 80% of the total number of crime incidents in from 2012 to 2014 (see Figures 2-5). Violent crime (defined here as the combination of assault and robbery) is observed in a much smaller proportion, representing from 12-14% of total crime in each of the years from 2012 to 2014.Larceny, which includes any type of theft offense, constitutes over half of the total number of crime incidents from 2012 to 2014. Burglary, which includes any breaking and entering offenses, constitutes over a quarter of the total number of crime incidents during this time period, second only to larceny. The next two most frequent offenses – aggravated assault and robbery – trail significantly, comprising only 8-9% and 5% of total crime incidents, respectively, in the three-year span. Similar to my previous study, I use the Real Property Delinquent Taxpayer list from the Durham County Tax Collector to randomly select 35 delinquent owners and their properties in Durham city. For selection in to the sample, the property must have at least three consecutive years of unpaid (as opposed to partially paid or fully paid) tax bills. The intuition behind this decision is that homes with multiple consecutive years of unpaid bills will be most likely foreclosed by Durham county for failure to pay property taxes; therefore, the homes will be the most distressed. For each address obtained, I use the Crime Mapper tool from the Durham Police Department (see Figure 6) to show the number of nearby crimes of assault, burglary, larceny, and robbery from January to December in each of the three years from 2012 to 2014. By including data from 2012-2014, I hope to capture the trends in crime over the life of a distressed property. Since most of the sampled properties have been delinquent for exactly three years, the addition of a time characteristic to the data set can provide an understanding about crime rates around a property throughout the distress process. Results from the Crime Mapper, similar to the previous study, are limited and recorded first within a 500-foot radius (which I label the “inner zone”) of the distressed property and then within a 1,320-foot (1/4-mile) radius (which I label the “total zone”)of the distressed property. While the Crime Mapper is also capable of providing crime information within a 1/2-mile radius of a given property, I elected to forgo collecting the 1/2-mile data, as results from this distance were unhelpful for showing the relationship between a distressed property and nearby crime under the assumptions of uniform and random distribution. In each of the first few cases collected at this distance, the numbers of total incidents of crime observed were too low to produce meaningful estimates. Given that a circle with a 500-foot radius has an area that is about 3.6% of the area of a circle with a 1/2-mile radius, there must be at least 28 observations of crime in the larger area to yield a random estimate of at least 1 crime in the inner zone. This means that for each type of crime, any 1 incident within the inner zone would be categorized as “above expected” if there were fewer than 28 incidents in the 1/2-mile radius circle, which holds true for the majority of the sampled properties. Thus, I have chosen to continue calculating the number of observed crime incidents within the inner zone with the number of observed crime incidents within a 1/4-mile radius total zone. Assuming a distressed property is not a hub for increased crime and that crime is uniformly and randomly distributed within the total zone without the influence of a distressed property, I aim to compare the number of observed crimes in the inner zone with the number of observed crimes in the total zone. Given the radii of the inner and total zones and assuming that the areas of focus are perfectly flat and circular, a quick calculation shows that the area of the inner zone is roughly 14.3% of the area of the total zone. Given the number of crimes in the total zone and the relative sizes of the inner and total zones, I then calculate the average number of crimes expected within the inner zone, given uniform and random distribution (i.e., without the concentrating “pull” of a distressed property in the center). Taking the “expected” number of crime incidents in the inner zone, I then compare the number of expected incidents with the number of observed incidents. If the number of observed crimes is higher than the number of expected crimes for more properties than not, then there might be evidence to support the hypothesis that the presence of a distressed property is associated with more crime. However, if the number of observed crimes is lower than the number of expected crimes for more properties than not, then there might be evidence to reject the same hypothesis. In discussing the results, I will define a property as “above expected” (AE) if the observed number of crimes within the property’s inner zone is above the estimate given by the property’s total zone. For example, if a property’s total zone estimates an expected 1.87 burglary crimes in 2014 in the property’s inner zone, and the observed number of crimes is 3, then we can categorize this property as an AE property with respect to burglary in 2014. The AE designation of a property is dependent on both the type(s) of crime and the time period specified.In general, if the number of AE properties rises from 2012 to 2014, there might be evidence to suggest that crime rates rise as homes become more distressed or remain equally as delinquent. Among the 35 sampled properties over the three years from 2012 to 2014, a total of 5,672 crime incidents were observed, with total crime falling from 1,824 in 2012 to 1,771 in 2013 and rising back to 2,077 in 2014 (see Table 1). With respect to the distribution of crime between the four types – assault, burglary, larceny, and robbery – used in this study, the observed crimes were directionally representative of the annual distribution of crime in Durham overall.Larceny, consistent with the citywide distribution, was the type of crime most observed in this sample, followed by burglary, assault, and robbery. While assault was observed in a slightly smaller proportion to burglary in this sample, it is noteworthy that the proportion of assault incidents in this sample is much higher than that of Durham overall. Over the three years covered in this study, assault makes up about 23.3% of this sample, but only about 8.5% of Durham crime (as a percentage of total assault, burglary, larceny, and robbery incidents total). This finding, while notable for showing disparities between this sample and Durham overall, is also consistent in this sample for each of the three years observed. In terms of the number of “above expected” (AE) properties found, more interesting patterns arise when analyzing results over the three years. 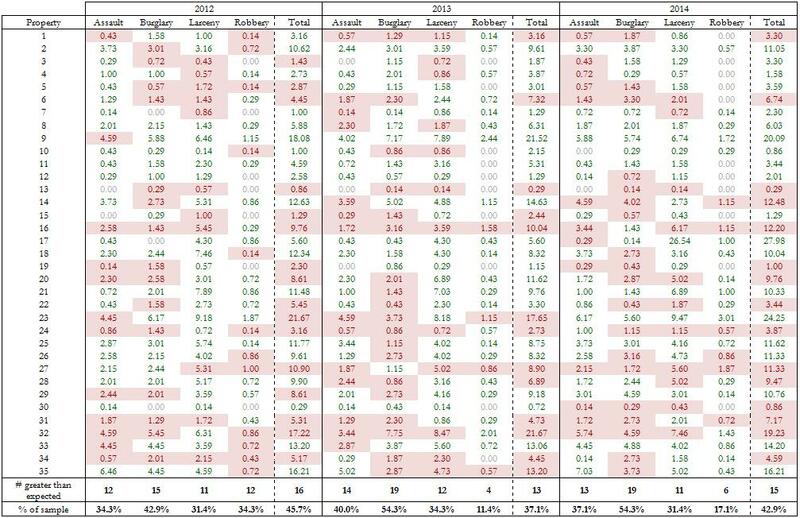 With respect to all crime incidents reported in a given year, the number of AE properties has been fairly consistent from 2012 to 2014 (see Table 2). This trend is also true of AE properties with respect to reported incidents of assault and larceny in each of the three years. With respect to burglary and robbery, the numbers of AE properties were much less consistent. The number of AE properties in burglary increased from 15 in 2012 to 19 in 2013 and 2014, while the number of AE properties in robbery decreased dramatically from 12 in 2012 to 4 in 2013 and 6 in 2014 (see Table 3). Recall that, as a result of the selection criteria for this sample, most of these properties have been in delinquency and distress for exactly three consecutive years. The change in the number of burglary and robbery-related AE properties can possibly fit in to the distressed narrative of these properties: as a property becomes more financially distressed, the property can become more neglected, which could provide more opportunities for breaking and entering type crimes. In Durham, breaking and entering is categorized as a burglary, which could explain the increase in the number of burglary-related AE properties from 2012 to 2014.At the same time, as a property becomes more neglected, it may be more likely that the property will be vacated or abandoned. With fewer people in and around the property itself, there may be fewer people to target in a robbery. The presence of fewer people also decreases the likelihood of having witnesses who can report crimes, which would also affect the number of observed robberies (though this works against the increased observation of burglaries). While these intuitions about the crime behavior around distressed properties can help begin to uncover the underlying mechanism responsible for these changes in observations and the change in the number of AE properties, they do not help explain the relatively smaller change from 2013 to 2014 (when compared to the change from 2012 to 2013). With respect to robbery, the number of AE properties drops dramatically from 12 in 2012 to 4 in 2013, but rises slightly to 6 in 2014. While the change is significant within the sample, it is also important to note that, in 2013, the Durham Police Department reports that the number of robberies were at a 23-year low in 2013. What remains unclear is whether this change is due to changes in prevention tactics, reporting policies, the climate of crime and criminals, or something else entirely. In considering all of these results, it is also important to note that results are based on crimes that must first be observed by a witness, and then reported and filed by the Durham Police Department. Clearly, it is unreasonable to assume perfect crime observation within any given area, but as mentioned before, the inability to observe and report crime may be increased in areas of high home distress or foreclosure. This is consistent with the idea that distressed and foreclosed homes result in temporary (or sometimes permanent) decreases in the population of the immediate area, particularly within the defined inner zone of 500 feet around a property. Additionally, the crime data used in this study do not completely account for cases in which a crime is catalogued under multiple types. Inclusion of these results affects interpretations about the distribution of the crime types that are observed within a given area. For improvement on this study in the future, additional research that compares the results of this study to a sample of properties in good financial standing may highlight differences in the level of AE properties found. Further research can also improve upon this study by following the sampled properties throughout the process of foreclosure to monitor the changes in crime levels. Continuing in research similar to the work of Cui and Walsh (2015), this type of research would provide further insight in to the crime behaviors near a foreclosed property through vacancy and re-occupancy. Unfortunately, studies such as these are limited by data related to specific foreclosed properties in Durham (and other cities). In terms of policy implications, understanding the relationship between crime and a property throughout its foreclosure lifecycle can help shape legislated foreclosure programs and processes to mitigate the increasing rates of crime. To begin understanding the relationship between property distressed and nearby crime in Durham, North Carolina, this study used publicly available data to map incidents of observed crime from 2012 to 2014 on a sample of distressed properties. Analyzing crime over each of the three years, the study took data related to incidents of larceny, burglary, assault, and robbery to determine an expected number of crimes within an inner zone, representing a 500-foot circle around the property, and compared these figures with the number of observed crimes. During the three years overall, results showed that the number of observed crimes is higher than the number of expected crimes with respect to only burglary, while the same is untrue for assault, larceny, and burglary. However, with respect to burglary and robbery, there were more dramatic shifts in the number of AE properties from 2012 to 2013, which could reflect a number of factors including the criteria and opportunity for reporting. Ultimately, this study can serve as the foundation for further research, given additional data related to the foreclosure process and crime behaviors of Durham properties. 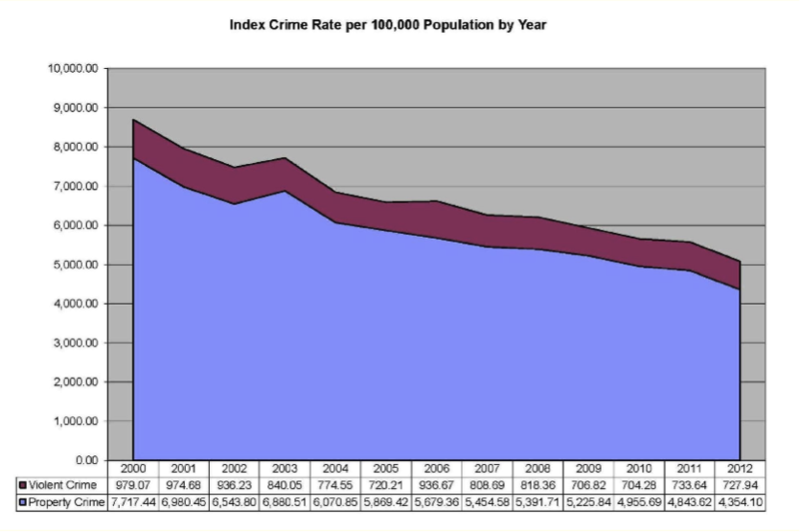 The figure depicts the trend of violent and property crimes since 2000 in Durham, notably showing the overall downward trend (despite the economic shocks of 2007-2009), though property crime continues to occur more frequently than property crime. The figures depicts the breakdown of the six most frequent types of crime from 2012-2014, showing that the property crimes of larceny and burglary have consistently total for about 80% of total crime for each of the last three years. 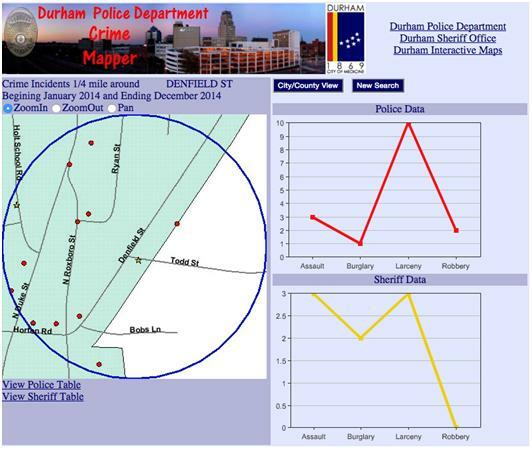 The figure depicts the results from the Crime Mapper tool available publicly online by the Durham Police Department. For a given address, the tool maps incidents of crime that can by a variety of criteria, including distance, time period (up to 12 months), and type of crime. 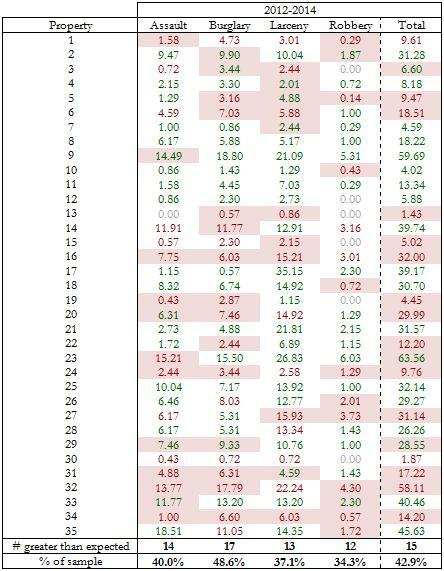 This table shows the number of observed crimes by type in each of the three years from 2012 to 2014, along with the percentage of each type observed within a given span of time. This table shows the number of expected crimes within the inner zone by type of crime. Data points bolded in red text and highlighted pink represent cases in which the number of observed crimes is higher than the number of expected crimes for a given property. Data points in green text represent the opposite. Data points with grey text had zero total observations for the given property.